This year 115 campers and 74 staff enjoyed a wonderful week of learning and living God’s way of life on the spectacular Oregon coast. Camp was held at the scenic Camp Magruder, near Rockaway Beach, Oregon. Campers riding horses on the beach at Northwest teen Camp. The overall theme for the camp, “Building Your Relationship With God,” was learned every day step by step through the daily themes that explored the main theme in more detail. New this year was the Christian living notebook provided to all campers and staff. The lesson scriptures, memory verses and “I will” statements for each day were in the notebook, along with room for notes for each lesson and from the dorm parent discussions at the end of each day. One reason for the notebooks was so the campers could share the lessons with their parents after returning home. We began the week with a record low tide in the morning. The campers went to the beach early and were able to walk over an expanse of ocean bottom rarely seen. 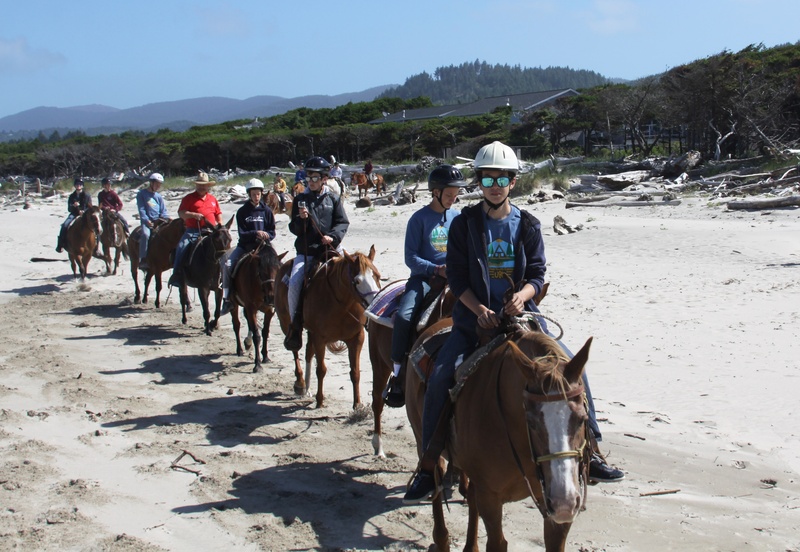 Chinook Pass Outfitters returned for the second year with 16 horses and three mules, providing campers and staff with the exciting opportunity to enjoy riding in the woods and on the beach. Staff members volunteered each morning and afternoon for the “clean up” after the horses so the camp property was kept tidy. The older dorms went on an eight-mile kayak trip down the scenic Nehalem river. Due to the incoming tides this proved to be physically challenging but rewarding. Wednesday evening everyone relaxed and visited on the Oregon Scenic Train ride. One highlight of camp was the evening campfire. The “seniors”—those in their final year as a camper—were asked to tell everyone what the camp experience has meant to them and pass on one piece of advice to the younger campers. Often the lessons and advice reflected a real spiritual understanding and determination to live God’s way of life. It makes all the hard work of camp worthwhile for the staff. LeeAnn Luker served at camp for her final year. She and Keith Tomes taught the “excellence in living” class. Their topic this year was “what it means to be a Christian woman” and “what it means to be a Christian man.” The discussions in the classes and subject continued long after the class had concluded. At the end of camp the staff requested to hear the material from class, so we added an extra excellence in living class on Sabbath morning. In arts and crafts class, Linda Arnold instructed campers in “glass beading.” Various colors of glass were broken into small pieces and then used to make a design—such as jewelry or a coaster—then baked in the kiln until everything melted together and the creation took shape. Other activities included dancing, softball, speedaway, riding boogie boards in the surf, pickleball, water skiing, archery, volleyball and swimming. Northwest Camp this year had an international flavor. We had two campers from New Zealand, two from the Netherlands and a young man who recently arrived in the U.S. from Ukraine and is just learning English. He proved to be a lively addition to his dorm brothers as they exchanged lessons—the U.S. campers teaching him English and he taught them how to handle a soccer ball! Northwest Camp for 2018 will be July 22-29. Make plans now to join us for one of the most memorable weeks of your life. A special thanks to all the hard working staff and to everyone for your prayers and support for the UYC camp program. Rex Sexton grew up in Illinois and graduated from Ambassador College in Big Sandy, TX in 1976. He began a career as a construction engineer in the Nuclear industry at Hanford, WA , and was hired full time in the ministry in 1982, and earned a Certified Financial Planner certification in 1994. He and his wife, Patricia, have served congregations in Oregon, Washington, and Alaska. In addition to pastoring responsibilities, they have also taught at and directed youth summer camps for many years.